The stellar growth of the SUV segment in India has prompted most major manufacturers to include such products in their lineup. Of all the SUVs sold in India, compact SUVs account for around 39% of the total number. So, naturally, Tata Motors wants a share of that very lucrative pie and it has tasked the Nexon with carrying out this job. The Nexon enters a fray that already has popular models like the Maruti Vitara Brezza, Ford EcoSport, and the Honda WR-V. Has Tata done enough to trouble its established rivals? Does the Nexon have what the discerning Indian car buyer demands? 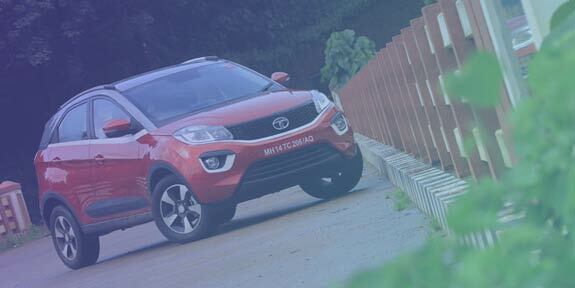 Read our Tata Nexon review test drive for answers. Based on the Impact design philosophy, the Nexon’s exterior is quite stunning. It has a very distinctive profile that blends the high riding stance of an SUV with the sporty sloping roofline of a sports car. The result is a car that is certain to turn heads wherever it goes. The styling of the Nexon stays true to the concept that made its debut back in 2014. In fact, the production spec model is identical to what was on display at the 2016 Auto Expo. The nose of the Tata Nexon is characterised by the ‘Humanity Line’ stretching across the car’s face separating the headlamps and grille from the bumper. It is also one of those rare instances where Tata has used chrome on the Nexon. The grille features a honeycomb pattern and has a glossy black finish. Nexon’s distinctive headlamp house projector units along with LED DRLs and bulging turn indicators. The side profile of the Tata Nexon reveals a sharply rising waistline and raked windshield that help amplify the SUV-coupe appearance. The tail lamps are clear lens units that get LED detailing. Almost every angle the car is viewed from reveals an interesting design detail. For instance, there’s something called ‘Slingshot line’. It is the thick ceramic finish line that runs from the A-pillar ducking under the C-pillar to culminate into an X-shaped ceramic element in the boot. This white ceramic finish, a first for any car in the world, contrasts well with the gloss black element right under the Tata logo to give the Nexon a rather distinctive rear end. Top-end variants, as seen in the images here, will get dual tone paint shades. Expect Tata to offer more options apart from the blue-gray and red-gray examples we had at our disposal. The SUV rides on 16-inch dual tone 5-spoke alloy wheel, which complements the dual tone paint shades really well. There is subtle black cladding around the wheel arches along with trapezoidal black elements in the front and rear bumpers. The dashboard design may not be as radical as the exterior, but it still scores high on style. And the 31 storage spaces all around mean it is practical too. The first thing that catches your eye is the floating dash-top touchscreen unit. Apart from upping the style quotient, its placement also serves a functional purpose as it sits level with the driver’s line of sight restricting instances of the driver losing sight of the road ahead. The Harman sourced unit supports Android Auto and will eventually offer Apple CarPlay support as well. The screen itself is very responsive to touch inputs and, in general, does not disappoint. However, the highlight here has to be the 8-speaker audio setup, which as far as standard ICE setups go, is right there at the top. It delivers an aural experience that is leaps and bounds ahead of its rivals. The dashboard is finished in a combination of black and beige split by a thick silver bar that runs across its length. A similar silver finish can also be seen around the ‘Grand Centre Console’ which houses the aircon controls, gear lever, and the multi drive mode selector. Positioned behind the rotary selector knob is the tambour door mechanism that slides to reveal a generous storage space. And there are plenty of those all around. There are deep door pockets that can hold big bottles with ease and there is also a rather nifty umbrella holder placed above it too. Tata has also managed to carve out a huge glove box that even comes with a detachable tray just like the ones in a refrigerator that can hold small bottles and can and keep them cool. Bits like the keyless entry and push button start are standard affair these days, but what is unique is the wearable key Tata offers with the Nexon. It eliminates the need to carry the bulky key fob in your pocket by substituting it with a fitness band like wrist accessory. It lets you lock/unlock the car and drive away without the presence of the actual key fob. Despite the SUV-coupe profile, the Tata Nexon does not feel cramped by any measure. There is ample legroom and headroom for an average size adult and the car can seat five in reasonable comfort. At 350 L, boot space isn’t class leading, but is big enough to swallow a washing machine with its full packaging claims Tata. While the seats offer good back and lumbar support, they fall a wee bit short when it comes to thigh support. They are reasonably comfortable and do a commendable job of holding you in place through corners. Certain bits inside the cabin are shared with existing Tata products such as the controls for the aircon unit and the steering wheel. The quality of some of the components in the cabin is a bit of a letdown. For instance, the IRVM feels a bit flimsy, as do the headlamp and wiper stalks. The quality of plastics, in general, could have been better. Tata will offer dual front airbags and ABS on the Nexon as standard fitment. There are two engine options to choose from – 1.2 L Turbocharged Revotron Petrol and 1.5 L Revotorq Diesel. Both produce a maximum output of 110 PS, but the former has peak torque of 170 Nm while the latter boasts a very healthy 260 Nm. The 1,198 cc three cylinder petrol mill benefits from turbocharging makes maximum power at 5,000 rpm and peak torque between 1,750-4,000 rpm. Thumb the starter button and the first thing you notice are the high levels of refinement at idle, especially for a three cylinder unit. However, the NVH levels rise quickly as the revs build up and the engine does tend to get loud at higher RPMs. It has a very weak low end, which means ascending hills can be a bit of struggle and will warrant frequent downshifts. That aside, the engine does rather well for its size, especially if the revs are kept above 2,500 rpm. Initial power delivery can get a bit jerky, but again, things get better at higher revs. Power is sent to the front wheels via a 6-speed manual transmission. It isn’t the slickest unit around and gear shift action can get notchy, especially, during down shifts. The 1,497 cc four cylinder diesel is the one that impresses more. It is the most powerful in its segment and produces the most amount of torque too. And thanks to that it is certainly more tractable than the petrol with peak torque coming in as low as 1,500 rpm. Once past 2,000 revs, the engine truly comes alive and keeps the Nexon surging forward till around 4,500 rpm. The 6-speed transmission complements the 1.5 L diesel unit well. The tall 6th gear ensures fantastic highway cruisability. Number of gear changes the diesel variant required was much less compared to the petrol and is quite easily the pick of the two. A rotary knob placed behind the gear lever lets you choose between three driving modes – Eco, City and Sport. As the names suggest, Eco mode retards throttle response to aid fuel efficiency, while the Sport modes turns it up a notch for spirited driving. The colour of the touchscreen display changes depending on the mode selected – Green for Eco, Blue for City and Red for Sport. Very good, actually. The steering feels nice and heavy and gives you the confidence to push the car hard around corners. It felt a bit rubbery around the dead centre position, but that aside, it is a joy to use. Tata engineers have put in a lot of work into the suspension setup and it clearly shows. There is an underlying stiffness that ensures the high riding Nexon does not roll too much. Ride quality isn’t soft, but the suspension irons out bumps with the kind of softness generally associated with more expensive cars. Suspension on both variants has been tuned slightly differently keeping the variation in weight in mind and it shows in the way the diesel pitches and bobs much less than the petrol. One of the USPs of SUVs and crossovers is the view of the road in front thanks to the relatively high seating position. While that is a quality the Nexon too can boast, there is a bit of an issue while going around a bend as the thick raked A-pillar creates a bit of a blind spot. Also, rear seat passengers may get a bit claustrophobic as a result of the rising window line and a relatively smaller DLO. If style is the top priority for you, then nothing comes close to the Tata Nexon in this segment. It has that in spades and will turn heads wherever it goes. And with Tata expected to offer multiple dual tone paint shades, there sure to be something to suit everyone’s tastes. This car has the potential to clock strong sales based purely on its looks. Even if you put the design aspect aside, it still is a very well rounded package. It can seat four in reasonable comfort along with their luggage. The equipment list is healthy and the Nexon has one of the best ICEs in the business. It rides and handles well and the diesel variant can be truly rewarding to drive. However, the Nexon is not without flaws. Quality levels in the cabin are underwhelming. The petrol motor isn’t particularly exciting and there is no automatic transmission option on offer yet. Without knowing the price, it is difficult to pass judgment on the Nexon’s value for money aspect. But this being Tata, expect an aggressive starting price of well under 7 lakhs with the top of line diesel retailing for around 10.50 lakhs. At that price point, the Tata Nexon will become a compelling buy in the compact SUV space.